Established for over thirty years, we are specialist dealers in English STC books (printed before 1640), Continental printed books before and up to the early 1600s and medieval and renaissance manuscripts, both decorative and textual. In all these fields we carry an extensive stock and aim to cover the widest possible range of subjects, languages and prices. We are known for the accuracy and depth of our descriptions and for the quality of our copies, usually in contemporary or fine bindings. The Workes of our Ancient and Learned Poet. Folio. ff. (xxiv) 376 (xiv). Black letter, some Roman and Italic, double-column. Woodcut initials (some large, foliated), ornaments and head-and tail-pieces throughout. Full page engraved portrait of Chaucer, within armorial genealogical border; title within fine woodcut border, depicting architectual features, grape-vines, allegorical figures (Law and Justice) and putti (McKerrow and Ferguson 232). Large woodcut arms to second t-p. Woodcut illustration of knight with lance, in front of a castle, to Fol. 1. Errata leaf at end. Occasional very minor spot or mark, faint waterstain to lower corner of later gatherings, title-page slightly shaved at foot, repairs or paper flaws to a few blank margins. ‘Edward Holland, Camerton 1874’ on fly. Armorial bookplates of ‘Caleb Scholefield-Mann’ and ‘Lancelot Holland’ to front pastedown. 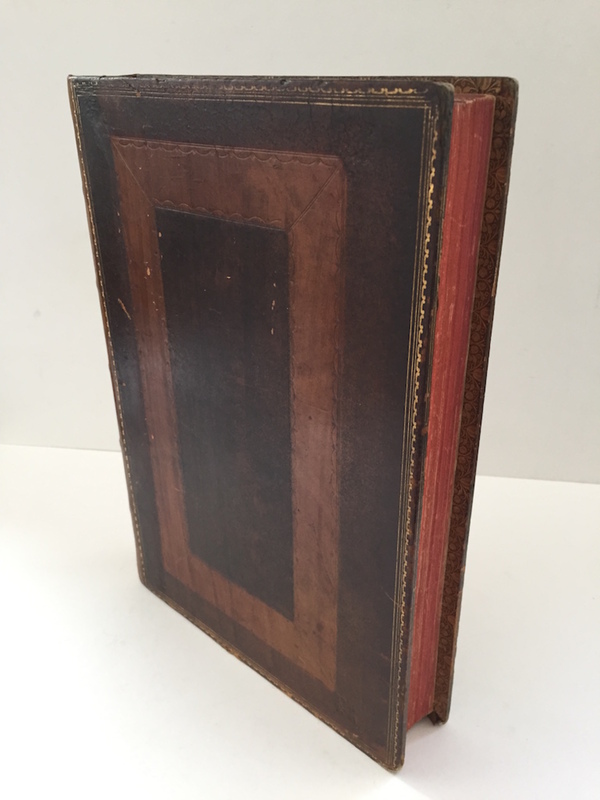 A very good, clean copy in early C19 calf, contrasting niger and tan panels and borders, edges with fillets and dentelles gilt, by T. Aitken (stamp to fly), rebacked, spine gilt in panels, red morocco label, all edges red. A handsome copy of the second edition of Thomas Speght’s (d. 1621) complete Workes of Chaucer, significantly enlarged and revised from the first edition of 1598. “It is the earliest in which thorough punctuation was attempted, and in many other ways it is a distinct improvement upon Speght’s first edition” (Pforzheimer). Little is known of Speght, other than that he was a schoolmaster. The work is dedicated to Sir Robert Cecil, first Earl of Salisbury (1563 – 1612). An introductory letter by the minor English dramatist Francis Beaumont (1584 – 1616) elegantly defends Chaucer’s eminent literary position, as well as explaining some of the aspects of his work which an early C17 audience might find difficult or distasteful. The principal objections are that “many of his words are become (as it were) vinewed & hoarie with overlong lying; and next, that some of his speeches are somwhat too broad & plaine”. In any case, Beaumont continues, Chaucer is positively genteel in comparison with highly-esteemed Classical Latin poets, such as Catullus and Tibullus, who “in uncleane wantonnnesse beyond measure passe them all”. As well as texts of Chaucer’s extant works, such as his early translation of The Romaunt of the Rose, his shorter poetical compositions, the more prosaic Treatise on the Astrolabe, and his unfinished masterpiece, The Canterbury Tales, this edition contains a wealth of supplementary material, including a biographical essay and a glossary (‘The old and obscure words in Chaucer explaned’). The glossary provides explanations for words which have fallen into disuse, or changed their meanings, with etymological notes on their derivation from Arabic, Greek, Latin, Italian, French, Dutch or Anglo-Saxon. ‘Crone’, for example, is glossed as ‘an olde prating woman’ and a ‘costrell’ is a ‘wine pot’. Further glossaries of Latin and French terms follow (‘Cor meum eructavit’ – ‘My heart hath belched out’), along with notes on the Classical and contemporary authors cited by Chaucer (‘Augustine, that famous Doctor and Bishop, wrote more bookes than ever did any in the Church of the Latines’). STC 5080; Lowndes II, 425; Pforzheimer 178; not in Grolier.